The UW Medicine Regional Heart Center was first in the United States to deploy a device in the clinical trial that, if successful, would lead to more transplant-viable donor hearts in America. (Click to enlarge.) In the Organ Care System, the donor heart is readied for transplant at UW Medical Center. The first patient to receive a transplanted heart in the trial, Ted Daniels, is recovering well and is scheduled to be discharged from UW Medical Center on Oct. 16. Daniels, 46, a logging truck driver who lives with his family in Aberdeen, Wash., was diagnosed with congestive heart failure a decade ago. He was transplanted Sept. 16, 2015, with a donor heart that had traveled in the Organ Care System manufactured by TransMedics of Andover, Mass. The device is known in medical shorthand as "heart in a box." Its potential advantage – what the trial will measure – is its ability to extend the duration that a heart can safely be out of a body between a brain-dead donor and a recipient, and thereby increase the distance that donor organs can travel. The device circulates blood through the organ, prospectively giving surgeons eight to 10 hours between harvest and transplant. 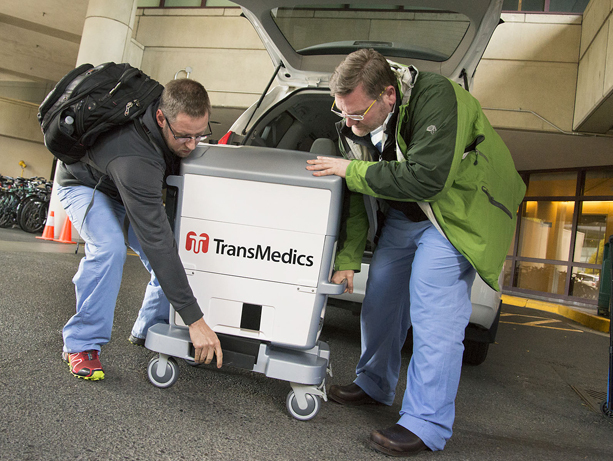 This is in contrast to the conventional mode of transit, on ice in a small cooler, which necessitates that transplant occur within four to six hours. The device is also being evaluated for its potential to take an intended donor heart that does not initially function well enough to be transplanted and, given time to rid it of toxins borne out of the fatal trauma to the donor, to make the organ transplant-viable. Transplant recipient Ted Daniels, his wife Nikkol and their two daughters answer questions at the Oct. 14 press conference. (Click to enlarge.) Transplant recipient Ted Daniels, his wife Nikkol and their two daughters answer questions at the Oct. 14 press conference. Information about the donor heart's location in specific cases is protected by law and cannot be shared due to the likelihood that the donor might be identifiable, counter to the family's wishes. To Daniels, the thought that he might be part of a leap in patient care "makes me tingly and excited inside," he said earlier this week. "Transplant is an experience that opens doors to people like me, and now the hearts can come from much farther away. "It makes me happy to know that I'll probably get to see my daughters (ages 16 and 7) graduate and get married."